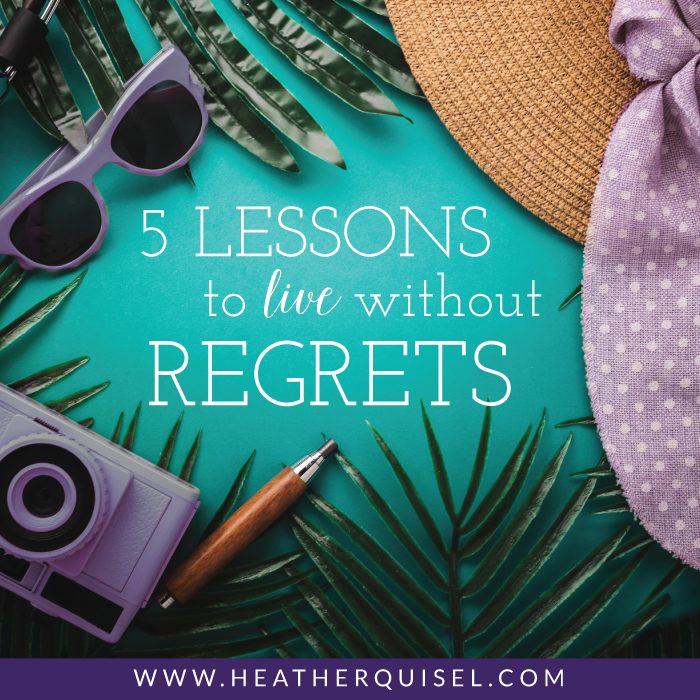 What would it be like for you to live your life without regrets? With the recent passing of my husband Larry Quisel, I have been left without guarantees or certainty in many areas of my life. But one thing I know for sure is how to live without regrets. 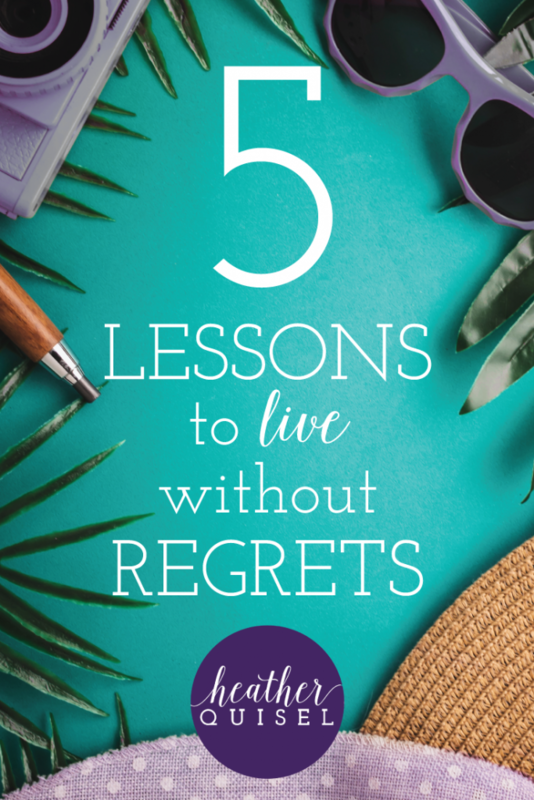 I can honestly say that my husband and I lived a life together without regrets. My husband died just 4 weeks ago, and as early as the same day that he was found dead, I was at peace. Peace even in the midst of grief because I had no regrets for the way we lived our lives together…and I know that he didn’t either. Reflecting on Larry’s life, the way he lived it, and the way he loved us, I realize that he left us with 5 powerful life lessons and I want to share them with you. Have you done the very best you could do today? Larry never just dipped in a toe. He went all in whether it was fitness, fatherhood, or starting his own business. And you know what? He nailed it. Going all in requires you to ask yourself, “Have I done the very best that I can today?” If you can ask this of yourself every day and also respond, “Yes!” then you are on your way to leaving your legacy with the world. If it’s not a yes every day, just keep moving closer and closer to that yes. Have I done my very best today? Larry said it all. Even as a man of few words, he told it straight. Integrity, honesty, and intentional with his word. Does it always have to be a highly verbal articulate conversation? NO…so much can be said with actions and nonverbal communication. Larry made people feel important. He called. He texted. He sent random messages when he saw something that made him think of a friend. Living a life without regrets includes having hard conversations. Don’t shy away from hard conversations…Just recently, I had been struggling with a business owner who provided services for me. I’d been going to her for a year and a half, and over time, I began to dread going to my appointments with her. I felt she’d grown dissatisfied in her job, and wasn’t her light-hearted self. In fact, her energy was heavy and I began to feel like a burden to her. And that’s definitely the energy I wanted to leave appointments with. I wasn’t sure how to break up with her. Do I just stop going? Do I call and say something? And what do I say? Yes, Larry dropped the truth bombs all the time. He always confronted the uncomfortable, and he did it while maintaining the integrity and respect of the other person. Do the people around you know how you feel about them? Even without saying it with words, who can you “tell” that you love them? This is such a vital lesson to live your fullest life. Larry believed in doing the HARD THINGS. The way to be great is by doing, repeatedly, the actions and jobs that most people didn’t enjoy doing. And he still didn’t enjoy them, for sure, but he did them anyway. I remember just a few years ago over dinner with him, he’d voiced how important he felt it was that we parent our kids to understand the importance of doing the things you don’t want to do. Who actually wants to fold and put away laundry? Who actually wants to show up at the gym every morning at 5 am? Who actually wants to pick up the phone and make sales calls, or drop in on potential customers unexpectedly? Um. . . very few want to do the hard/annoying/mundane but it’s those who DO who achieve greatness. Greatness is achieved through the consistent, persistent actions that most people won’t do. He believed in doing those hard things so that you believe in yourself. You believe in your own strength. You believe in the power of your word to yourself. What are the hard things that you’re being called to do in every part of your life? The hard things in parenting? The hard things in building a business? The hard things in reaching your health goals? You can do these things. And you can keep doing them day after day. I’ve recently become a widow with 3 children to raise by myself. This is in the category of Hard Things. . . and because of Larry’s legacy, we will get up and tackle the hard things every single day. I’m pretty intense and I take life very seriously. I admit it. I work like my job is on the line every day and I don’t take time to play because I often feel that there are other priorities. He blasted Taylor Swift songs in the car with our teenage daughter. He whipped his shirt off every morning in the gym parking lot to make us laugh at the absurdity of “airing out his pecks”. He acted silly just to get a laugh. He was a manly 40-year old man who knew every lyric to every Taylor Swift song. Why? So he could relate and connect with his teenage daughter. And that my friend, is a powerful legacy. As we unpacked our luggage on our 5-star luxury trip and he pulled on his brand new Beer Me! shirt. Me being the serious one, thought it was ridiculous! These are professionals that I work with! This is the corporate staff! What will they think? What will they think of me? But Larry wasn’t worried about any of that. 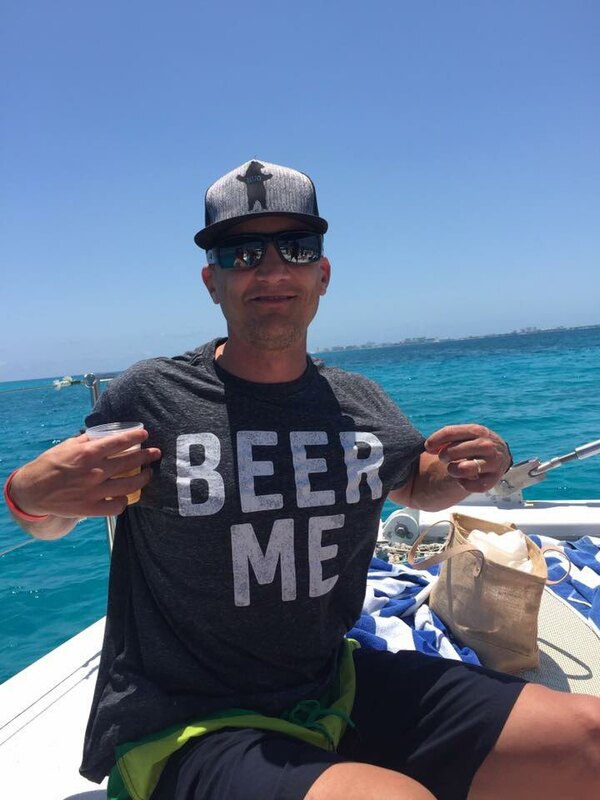 He shows up with this BEER ME t-shirt and what do you think happens? He brought the fun to everyone. He just advertised, through a t-shirt, that he was there to have fun, let loose, and was looking for friends to join in. Boy, did they ever. And everyone, including me, had a blast with that t-shirt and its message. People talk often about finding your calling. Finding your purpose…like it’s a treasure hunt, and as if it’s hidden from you. Don’t be fooled into thinking that other people are lucky to have FOUND their calling, while you are over there fumbling around…often waiting for it to present itself. Calling and purpose are often created, and we create it through action. What’s important to know about action is that taking action, in itself, is often risky. My husband worked hard in the construction industry…he had a high paying, high caliber job but he couldn’t be there for our kids. So he made a company move. By that time, he felt like he’d made mistakes. Regret. And then, he did something even riskier than changing jobs again, he walked away. He bought a business – and not one with equipment or assets or buildings – he bought a customer list and no guarantee that those customers would choose to purchase from him at all. Risk. But it was inspired risk. But he just felt it was right. And let me be honest…it feeling right also felt very scary. He was often overwhelmed, frustrated, afraid, and sometimes panicked. But he stayed the course. And when he finally purchased that business, he went back to Lesson One that I shared, and he went ALL IN. It was a RISK he made because he knew it felt right. Not because it made sense…most people think steady pay, retirement plans, and a familiar office make sense. He knew he wanted more. He knew he could do more. And it succeeded because he was willing to go All In, Do the Hard Things, Say It All, and Find the Fun the whole time, even while taking Inspired Risks. 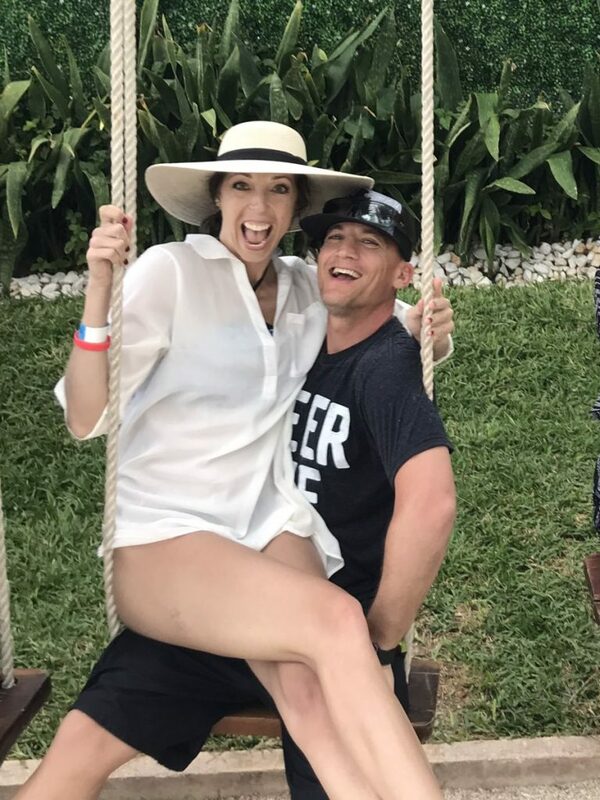 What I’m learning, as a brand new widow, is that you have this one life, and YOU have the ability to live life to the fullest, live every moment like it’s your last, and live life like you mean it! Thank you, Larry Quisel for being the example that you are. And thank you for being here, reading this, and working towards being the greatest version of you.